Plants perennial; cespitose from a hard, knotty base, with or without rhizomes. 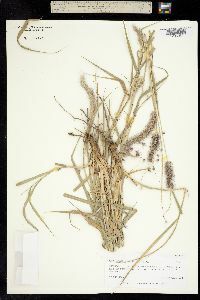 Culms 10-150 cm, erect, sometimes branching at the aerial nodes, glabrous, sometimes scabrous beneath the panicle; nodes glabrous. Leaves green or glaucous; sheaths glabrous or pubescent, margins ciliate; ligules 0.5-3 mm, membranous, ciliate; blades 3-50 cm long, 2-13 mm wide, flat, glabrous or pubescent, margins ciliate or glabrous basally. 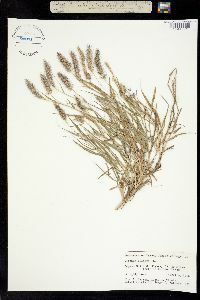 Panicles 2-20 cm long, 4-35 mm wide, fully exerted from the sheaths, erect, green, brown, brown-purple, or dark purple; rachises terete, scabrous. 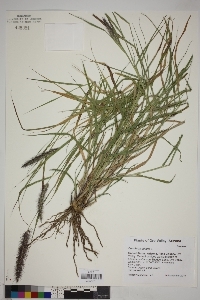 Fascicles 11-37 per cm, disarticulating at maturity; fascicle axes 0.2-1.5 cm, with 1-12 spikelets; outer bristles 16-89, 0.3-11.7 mm, many exceeding the spikelets; inner bristles 7-20, 3.8-13.8 mm, fused to 1/4 of their length, flattened, grooved, ciliate; primary bristles 10.5-23 mm, long-ciliate, noticeably longer than the other bristles. Spikelets 2.5-5.6 mm, sessile, glabrous; lower glumes 1-3 mm, 0-1-veined; upper glumes 1.3-3.4 mm, about 1/2 as long as the spikelet, (0)1-3-veined; lower florets staminate or sterile; lower lemmas 2.5-5.3 mm, 3-7-veined; lower paleas absent or 2.5-5 mm; anthers absent or about 1.4 mm; upper florets not disarticulating at maturity; upper lemmas 2.2-5.4 mm, (3)5(6)-veined, margins glabrous; anthers 1.4-2.7 mm. Caryopses 1.2-1.9 mm long, 0.4-1 mm wide, concealed by the lemma and palea at maturity. 2n = 36 [B. Valdés, R. Parra, A.M. Sánchez, and M.D. Díaz. 1999. Números cromosómicos de plantas de Marruecos, IV. Lagascalia 21:235-240], 45. 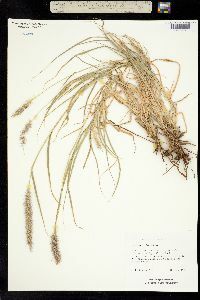 Pennisetum ciliare is native to Africa, western Asia, and India. It now grows throughout the warmer, drier regions of the world, often as a forage crop, and is established in much of southern Texas. 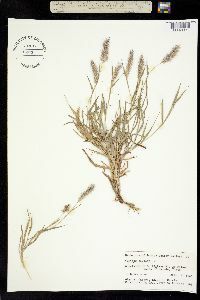 It is sometimes included in Cenchrus, based solely on the fusion of its bristles. Perennials, Terrestrial, not aquatic, Rhizomes present, Rhizome short and compact, stems close, Stems nodes swollen or brittle, Stems erect or ascending, Stems geniculate, decumbent, or lax, sometimes rooting at nodes, Stems caespitose, tufted, or clustered, Stems terete, round in cross section, or polygonal, Stems branching above base or distally at nodes, Stem internodes solid or spongy, Stem internodes hollow, Stems with inflorescence less than 1 m tall, Stems, culms, or scapes exceeding basal leaves, Leaves mostly cauline, Leaves conspicuously 2-ranked, distichous, Leaves sheathing at base, Leaf sheath mostly open, or loose, Leaf sheath smooth, glabrous, Leaf sheath hairy, hispid or prickly, Leaf sheath and blade differentiated, Leaf blades linear, Leaf blades 2-10 mm wide, Leaf blades mostly flat, Leaf blades mostly glabrous, Leaf blades more or less hairy, Ligule present, Ligule a fringe of hairs, Inflorescence terminal, Inflorescence a dense slender spike-like panicle or raceme, branches contracted, Inflorescence solitary, with 1 spike, fascicle, glomerule, head, or cluster per stem or culm, Inflorescence spike linear or cylindric, several times longer than wide, Inflorescence single raceme, fascicle or spike, Flowers bisexual, Spikelets pedicellate, Spikelets sessile or subsessile, Spikelets dorsally compressed or terete, Spikelet less than 3 mm wide, Spikelets with 1 fertile floret, Spikelets with 3-7 florets, Spikelets 1-4 in short bristly fascicles, Spikelets all alike and fertille, Spikelets bisexual, Spikelets disarticulating below the glumes, Spikelets falling with parts of disarticulating rachis or pedicel, Spikelets in bur-like clusters or fascicles with fused bracts, bristles or spi nes, Spikelet bristles fused together, Spikelets all subtended by bristles, Spikelet bristles 4-many, Spikelet bracts or bristles disarticulating with spikelet, Glumes present, empty bracts, Glumes 2 clearly present, Glumes equal or subequal, Glumes shorter than adjacent lemma, Glumes 1 nerved, Glumes 3 nerved, Lemmas thin, chartaceous, hyaline, cartilaginous, or membranous, Lemma similar in texture to glumes, Lemma 5-7 nerved, Lemma glabrous, Lemma apex acute or acuminate, Lemma awnless, Lemma margins thin, lying flat, Lemma straight, Palea present, well developed, Palea membranous, hyaline, Palea about equal to lemma, Palea 2 nerved or 2 keeled, Stamens 3, Styles 1, Styles 2-fid, deeply 2-branched, Stigmas 2, Fruit - caryopsis.